Many pattern recognition techniques have been proposed, typically relying on feature spaces. However, recent studies have shown that different data representations, such as the dissimilarity space, can help in the knowledge discovering process, by generating more informative spaces. Still, different measures can be applied, leading to different data representations. This paper proposes the application of a second-order dissimilarity measure, which uses triplets of nearest neighbors, to generate a new dissimilarity space. In comparison with the traditional Euclidean distance, this new representation is best suited for the identification of natural data sparsity. It leads to a space that better describes the data, by reducing the overlap of the classes and by increasing the discriminative power of features. 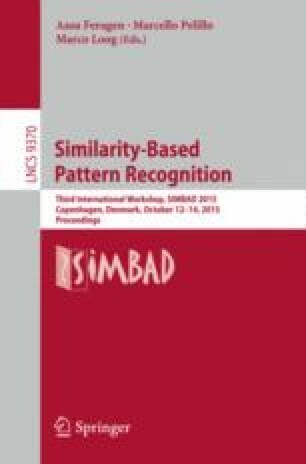 As a result, the application of clustering algorithms over the proposed dissimilarity space results in reduced error rates, when compared with either the original feature space or the Euclidean dissimilarity space. These conclusions are supported on experimental validation on benchmark datasets. This work was supported by the Portuguese Foundation for Science and Technology, scholarship number SFRH/BPD/103127/2014, and grant PTDC/EEI-SII/2312/2012. A total of 36 benchmark datasets from two repositories are used for the experimental evaluation of methods. The majority of the datasets are from the UCI Machine Learning Repository1, and only a few datasets are from the 20-Newsgroups database2. A summary of the datasets in terms of number of samples, dimension of the feature space and number of classes is presented in Table 4.